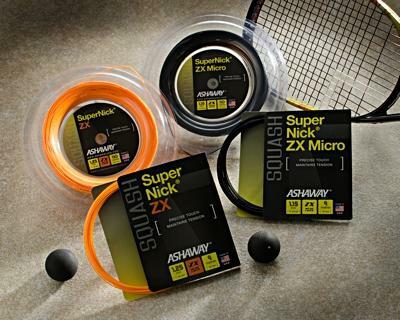 Ashaway, RI — Ashaway’s family of SuperNick® ZX squash strings offers a new set of playing characteristics that rounds out the company’s diverse line of squash string capabilities. Combining nylon multifilament cores with special wear layers of Zyex® filaments, SuperNick ZX strings provide precise touch, maintain string tension, and maximize spin potential. The SuperNick ZX family joins Ashaway SuperNick® XL, UltraNick®, PowerNick® and Liberty® squash strings to comprise the sport’s broadest and most popular line. Ashaway Racket Strings are made by Ashaway Line & Twine Mfg. Co., the only U.S. manufacturer of string for squash, tennis, racquetball, and badminton. Operated by the Crandall family since 1824, Ashaway has been making racquet strings since 1949, and is responsible for several important technical innovations. Ashaway has been the Official String of USA Racquetball for more than fifteen years. Ashaway Line & Twine Mfg. Co. also makes braided products for medical and industrial applications. For more information visit www.ashawayusa.com. Zyex is a registered trademark of Zyex Ltd.